Sheer lamps seamlessly embrace the light from outside, the reaction is nothing but a golden sunshine. With plenty of light and luminescence the experience is a glow from in and out. The double wash and the greenery within it is all welcome feature. We all opt for something to separate the wash from the shower areas. The sliding doors with the jacuzzi sort of inner pool space is totally aloof of the normal wash. The small full length stand for the goodies and its placing at a reachable height from the pool keeps it dry and very handy. 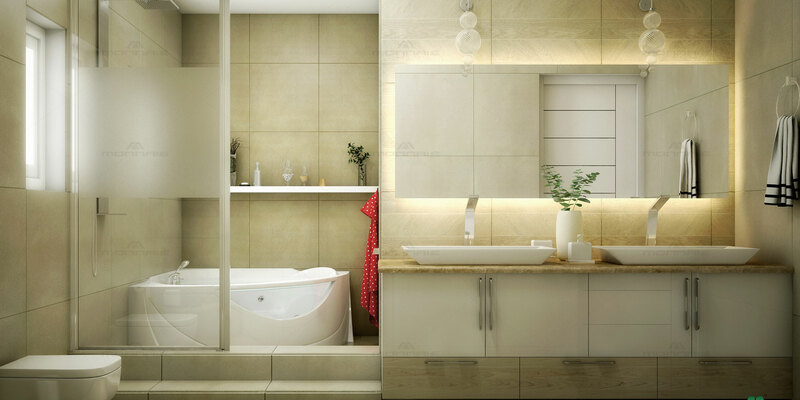 The bath fresheners along with the ring is a calculative feature which most of the bathroom need.